But their success has also meant an increase in the surveillance and policing of Indigenous peoples and their movements. 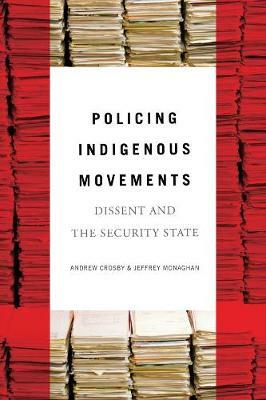 In Policing Indigenous Movements, Crosby and Monaghan use the Access to Information Act to interrogate how policing and other security agencies have been monitoring, cataloguing and working to silence Indigenous land defenders and other opponents of extractive capitalism. Through an examination of four prominent movements -- the long-standing conflict involving the Algonquins of Barriere Lake, the struggle against the Northern Gateway Pipeline, the Idle No More movement and the anti-fracking protests surrounding the Elsipogtog First Nation -- this important book raises critical questions regarding the expansion of the security apparatus, the normalization of police surveillance targeting social movements, the relationship between police and energy corporations, the criminalization of dissent and threats to civil liberties and collective action in an era of extractive capitalism and hyper surveillance. Andrew Crosby is a Coordinator with the Ontario Public Interest Research Group (OPIRG) at Carleton University. Jeffrey Monaghan is an Assistant Professor at the Institute of Criminology and Criminal Justice, Carleton University. His research examines practices of security governance, policing, and surveillance.